The structure which houses the Museum of the Middle Ages, Musée National du Moyen Age, was built in the late 1400s and early 1500s and combines Gothic and Renaissance architecture. 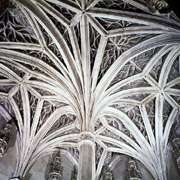 Over the centuries, this building has been many things. Its life as a depository of medieval artifacts began in 1833 when Alexandre du Sommerard, an avid collector, bought the property and installed his collection there. When he died in 1842, the building and the collection were acquired by the State and inaugurated as the Museum of the Middle Ages on May 17, 1844. 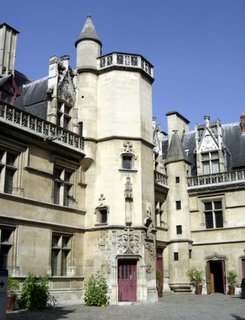 In 1945, the Chateau d'Ecouen contributed its collection of Renaissance artifacts and the Parvis de Notre Dame also made contributions to the museum. The building was constructed on the remains of Gallo-Roman baths, dating from the 3rd century, known as the "Thermes de Cluny". The Museum of the Middle Ages consists of two buildings: the Frigidarium or "cooling room", the remains of the Roman bath, and the Hôtel de Cluny, which houses the museum's collection. The museum contains a variety of important artifacts dating from the Middle Ages. 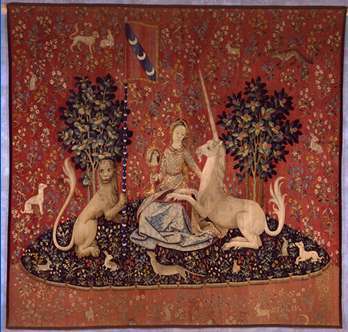 It is renowned for its tapestry collection, which includes La Dame à la Licorne (The Lady and the Unicorn)consisting of a series of six pieces. Other notable works in the collection of the Museum of the Middle Ages include Gothic sculptures from the 7th and 8th centuries, works of gold, ivory, antique furnishings and illuminated manuscripts. 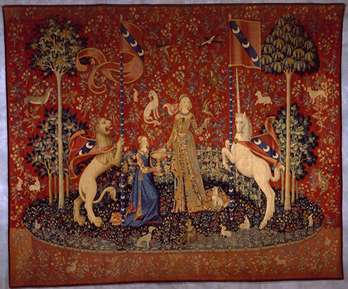 On the grounds of of the Museum of the Middle Ages is the garden "Forest of the Unicorn" (Forêt de la Licorne), inspired by the tapestries. All the plants in this garden are representative of plants from the Middle Ages. 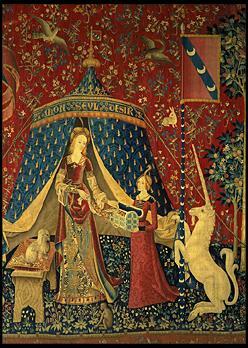 The Lady and the Unicorn (La Dame à la Licorne) is the title of a series of French tapestries considered one of the greatest works of art of the Middle Ages in Europe. They are estimated to have been woven in the early 16th century (c. 1511), in Flanders. They depict the six senses - Taste, Hearing, Sight, Smell and Touch, and another called, "A Mon Seul Désir" ("To My Only Desire"), often interpreted as representing Love. 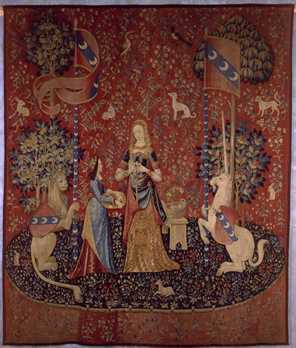 Each of the six tapestries depicts a noble lady in the company of a unicorn. 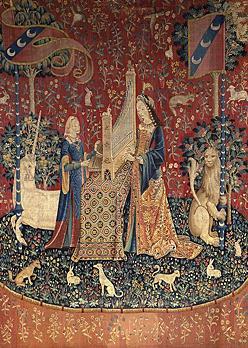 Some of the tapestries also include a monkey or a lion in the scene. 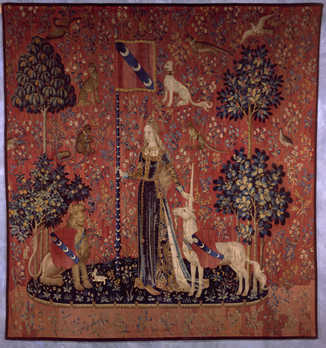 The pennants, as well as the armor of the unicorn and the lion in the tapestry, bear the arms of the sponsor, Jean Le Viste, a powerful nobleman in the court of King Charles VII. The tapestries are done in the style of mille-fleurs (thousand flowers). The tapestries were re-discovered in 1841 by Prosper Mérimée in the Boussac Castle. Novelist George Sand brought public attention to the tapestries in her works. The Lady is taking a candy from a dish held by a maid-servant. Her eyes are on a parrot on her upheld left hand. The lion and the unicorn are both on their back feet reaching up to pennants that frame the Lady on either side. The monkey is at her feet, eating one of the candies. The Lady plays an organ on top of a table covered with a Turkish carpet. Her maid-servant stands to the opposite side, and holds the organ in place. The lion and unicorn once again frame the scene holding up the pennants, but in this scene, their positions are reversed so that they are inside the frame. The Lady is seated, holding a mirror up in her right hand. The unicorn kneels on the ground, with his front legs in the Lady's lap. He gazes at his reflection in the mirror. The lion on the left holds up a pennant. The Lady stands, making a wreath of flowers. Her maid-servant holds a basket of flowers within her easy reach. Again, the lion and unicorn frame the Lady while holding on to the pennants. The monkey has stolen a flower which he is smelling, providing the key to the allegory. The Lady stands with one hand touching the unicorn's horn, and the other holding up the pennant. The lion sits to the side and looks on. This tapestry is wider then the others, and has a somewhat different style. The Lady stands in front of a tent, across the top which reads "A Mon Seul Désir", (To My Only Desire). Her maid-servant stands to the right, holding open a chest. The Lady is placing the necklace she wears in the other tapestries into the chest. To her left is a low bench with bags of coins on it. The unicorn and the lion stand in their normal spots framing the Lady while holding onto the pennants. This tapestry has received a number of interpretations. One sees the Lady putting the necklace into the chest as a renunciation of the passions aroused by the other senses and as an assertion of her free will. Another sees this tapestry as representing a sixth sense of understanding. Other various interpretations see the tapestry as representing love or virginity. The Museum of the Middle Ages is open every day, except Tuesday, from 9:15 a.m.-5:45 p.m. It is closed on Tuesday. Admission fees are 8.50 euros for adults; 6.50 euros for persons between 18-26 years of age and free for those under 18 years of age. The museum is free for everybody on the first Sunday of the month. Audio-guides are provided free of charge. A children's audio-guide is available for 1 euro. The Museum of the Middle Ages has a bookstore and a free coat-check is available. For further information, visit the Musée National du Moyen Age website.